Looks like this thing needs a beer. Last weekend, my drinking buddy Chase and I got our share of DC last weekend when we when to the now infamous Washington National’s NLDS Game 5 collapse and the Snallygaster beer festival. I’ve already talked about beer at Nats Park, and not a lot has changed since (for better or worse). 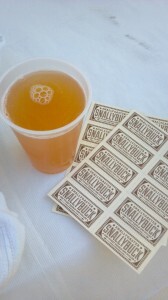 Beer-wise, I was most excited about Churchkey guru Greg Engert’s newest project: Snallygaster. Why the weird name? There’s some history there. As early as the 1730s, German settlers in Maryland were terrorized by a beast they referred to as Schneller Geist (meaning quick spirit). The dragon-like creature, which is now referred to as Snallygaster has popped up a few times over the centuries since, but nobody has been able to provide real proof of its existence. I guess the powers-that-be decided this mythical creature would appeal to the often eclectic DC beer community and that, combined with some amazing beers and great weather, turned out to be a good decision. I was faced with far more beers that my liver or my wallet could handle, so I was pretty glad they posted the festival’s beer list ahead of time. Chase and I picked up the Gargantuan pass, which essentially was the VIP pass and meant we got an hour early entry, 25 tickets, and a t-shirt. This is my only point of contention with the whole event. The other pass was only $25 and you got 25 tickets and a mug. I actually would have rather the mug over the t-shirt…and I saw some non-Gargantuan pass holders wondering around during the “early” admission hour. In hindsight, I would have gotten the other pass. Oh well! I wanted to start off easy with some sours before hitting the big boys. Luckily, Smuttynose provided a nice little offering I had never heard of before and hope to have again: Strawberry Short Weisse. It hit the spot nicely and we took in the scenery…which was wonderful. Next up was a real rarity, Schneider’s Tap 5 Meine Hopfen-Weisse aged in Zymatore barrels. I was really excited about this beer because I love what Schneider does with their beers and had no idea they aged any. The wine barrels improved this beer significantly and it would have been my favorite, if good old Uncle Jacob hadn’t made an appearance. Best beer I’ve ever had out of a plastic cup. 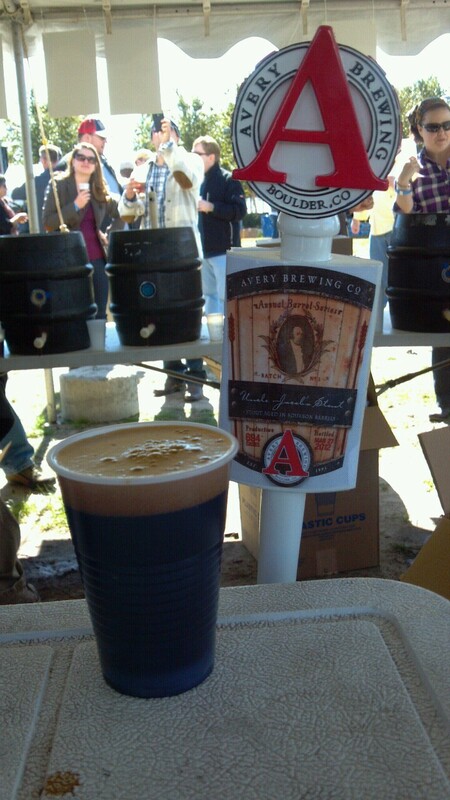 It didn’t take long before my bourbon barrel aged loving palate was drawn to the Avery tent. I missed buying bottles of the famed 17.5% ABV imperial stout, so I was not missing the chance to try it for the first time. Let me just saw, this beer is outstanding. Huge boozy bourbon, coffee, chocolate, roast, molasses, basically everything I want in a beer. Let’s just say that I had these three beers by 12:45pm and was feeling pretty good. In case you haven’t realized it yet, I’m a Bluejacket fanboy. The soon-to-be DC brewery is doing some great things, and they debuted two new beers at this beer festival: Mad Jacket Weizenbock, brewed in collaboration with Mad Fox Brewing Company, and Freestyle #10: Rye Session Saison, brewed in collaboration with Oxbow Brewing Company. Neither blew me away like Snack Attack! did, but they were both really nice offerings that calmed my consumption down from the previous three. This is where things started to get weird. 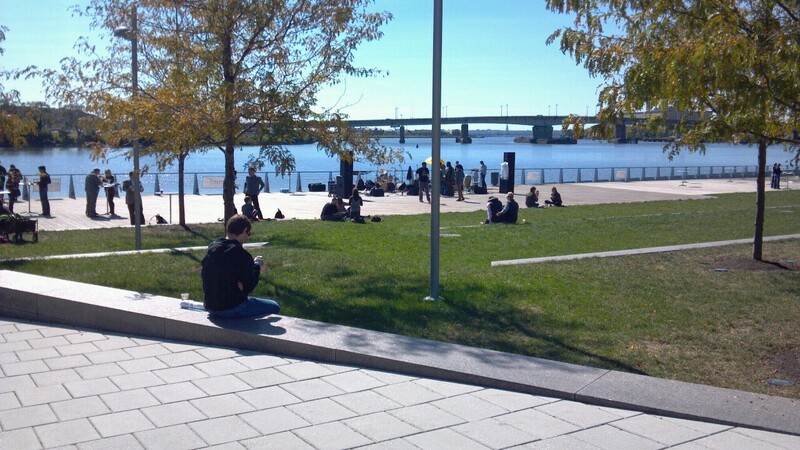 One, I thought the Anacostia River looked beautiful in the fall sun. 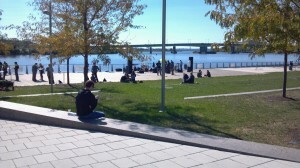 For those of you who know about Anacostia’s reputation in DC…you know where I’m coming from. For those of you who don’t…let’s just say it might not be as bad as New York’s famed East River, but it sure isn’t far. Two, I drank a beer brewed with Old Bay. Yes, you read that correctly, Old Bay seasoning in a beer. I’m not kidding for one second when I say I thought that sounded delicious, and let me tell you it was. Flying Dog Brewing Company blew this gose-style beer out of the water. I hear they only bring it out for festivals, so track it down if you see Flying Dog at your next stop. I finished up with Smuttynose Red Wine Barrel Scotch Ale, Professor Fritz Briem 1809: Zymatore Barrel-Aged, Schlaﬂy Tasmanian IPA, and Brooklyn’s Fiat Lux. Needless to say, it was a long metro ride home and a lazy afternoon as my body slept off the previous 24 hours. Other than the ticketing issue I hit on before, Snallygaster was a huge hit and the place was packed by the time we left (which was between 2 and 3pm). I really hope they do it again next year! I’ll be ready to get my Snally on. Last updated by Russ Beck at October 22, 2012 .